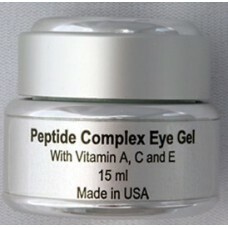 A powerful eye gel that helps firm under and upper eye lid, contain peptide complex, and pack with anti oxidant , very lightweight.. Peptides in this unique suspension stimulate collagen 1, collagen 111, and elastin fibroblasts, basically it help to boost collagen production, it plum up and smooth the skin. This stimulation supports the healing and repair response in the skin, increases skin thickness, evens skin tone and texture, and restores elasticity and firmness to the skin. MSM ensure that deep penetration below the upper dermal layers transform crepe paper skin into healthy, resilient, and firm skin around your eyes. For up to eight- fold antioxidant protection, ninety-six percent reduction of sunburn cells, and prevention of the formation of free radicals in sun exposed skin. Fades sun spots and discoloration, refines skin texture and reduces wrinkle formation as well as minimizing existing wrinkles. A gentle and effective treatment for delicate eye area to revitalize and turn back the clock. This eye treatment is a concentrated delivery system for the highest form of active, bio-available Vitamin C for radiant eyes. Who is this for : All skin type, for those who like to prevent or have a lack of firmness and tone around eye area. Ingredients: Organic Herbal Infusion, Organic Aloe Barbadensis Leaf Juice (Aloe Vera), Sodium Ascorbyl Phosphate (Vitamin C), Organic Simmondsia Chinensis (Jojoba Oil), Cucumis Sativus (Cucumber Distillate), Silk Protein Amino Acid Blend (Sodium L-Pyrrolidone Carboxylate, Sodium Lactate, L’Arginine, L-Aspartic Acid, L-Pyrrolidonecarboxylic Acid, Glycine, L-Alanine, L-Serine, L-Valine, L-Proline, L-threonine, L-Isoleucine, L-Histidine, L-Phenylalanine), Hyaluronic Acid, Methylsulfonylmethane (MSM), Acrylates/C10-30 Alkyl Acrylate Crosspolymer, (2s)-2-Amino-5-guanidinopentanoic Acid, Retinyl Palmitate (Vitamin A), Tocopheryl Acetate (Vitamin E), Organic Glycyrrhiza Glabra (Licorice), Organic Vinca Major (Periwinkle), Ethylhexyl Glycerin, Phenoxyethanol.